Yves here. We pointed out in 2005 in The Incredible Shrinking Corporation, that corporate investment, then at a time when the economy was growing, was so low as to amount to disinvestment. We warned again about this problem in 2010 in a New York Times op-ed and recommended that companies be taxed on retained earnings that were not reinvested, as well as taxes to discourage companies from acting as financial speculators (which many multinationals do). The problem of underinvestment, which is the result of pervasive short-termism, is not going to get any better unless incentives for CEOs change. American corporations borrowed more in the years following the Financial Crisis than ever before. Debt was dirt-cheap even for the riskiest borrowers, and they went out and sold bonds and borrowed from banks, and blew the proceeds on funding operating losses, buy each other out in a record-breaking wave of M&A, and buy back their own shares. And not enough went into productive investments that would help their businesses grow and thrive. This has been one of the reasons the economic recovery has been so crummy. Business investment is crucial, and there just wasn’t enough. And now it’s getting even worse. Over $1.8 trillion of US corporate bonds are rated below investment grade, having doubled since the Financial Crisis. But for these junk-rated borrowers, the costs of borrowing have been rising. At the bottom end, bonds rated CCC or lower sport an average yield of nearly 20%. These companies can no longer afford to raise money via bond offerings. At the upper end of the junk-bond field, just below investment grade, the average yield has risen to 6.5% from 4.5% in 2014. These companies can still borrow, but it’s getting much more expensive. Even investment-grade borrowers have seen their costs rise. The trailing four-week average junk-bond issuance plunged 85% from the same period last year to a minuscule $1.5 billion. The rising cost of debt “has to dull your willingness to invest going forward,” Rick Rieder, CIO of global fixed income at BlackRock told Bloomberg TV. As costs rise, US companies face even greater challenges investing – and that will put a drag on the economy, he said. This comes in an environment where profit margins are under pressure, where sales of S&P 500 companies have been shrinking for an entire year, and where their net profits are likely to have declined for three quarters in a row. This is a toxic cocktail for business investment. And it has started to show up in the official numbers. Orders for non-military capital goods excluding aircraft, a measure of investment in business equipment, fell 4.3% in December on a monthly bases, the sharpest drop in 10 months. They’re down 8.1% year-over-year. This is what companies order to build and expand their businesses, update their technologies and equipment, become more competitive, and move the company forward. These orders, at $65.87 billion in December, were the lowest since October 2013 ($64.1 billion), then September 2012 ($64.5 billion), and November 2011 ($64.47 billion). Note the mini-boom from October 2013 to September 2014, when capital goods orders hit an all-time peak of $73.9 billion, and when hope began to circulate that businesses would finally invest again, that the drought was over. 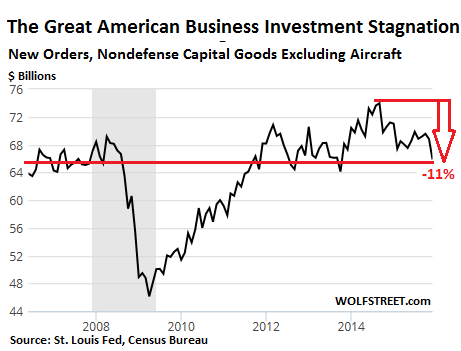 But then it all came unglued, and investment in capital goods has since plunged 11%. The broadest measure, orders of all durable goods, dropped 5.1% in December to $225.4 billion, the lowest since polar-vortex February 2015, and then October 2013. Excluding transportation equipment — volatile aircraft orders plunged 29.4% in December — durable goods orders still fell 1.2%. This pull-back was broad-based and not exactly encouraging. But US companies can’t blame the “strong dollar,” which these days conveniently gets blamed for just about everything when blaming the weather won’t do. The “strong dollar” makes imported components and equipment cheaper and has no impact on domestically produced equipment. So it should have encouraged investment. But no. The collapse of oil & gas investments has had some impact on the recent decline in business investment. But in prior years, when oil & gas investments were booming, overall business investment was already stagnating, and without oil & gas would have looked even more miserable. Years of QE and ZIRP, instead of generating a tsunami of investment in productive activities, and thus economic growth, have pushed financial engineering – share buybacks and M&A – to new levels that have left corporate America more leveraged, more fragile, and more financially unstable than ever before. As companies are starting to grapple with the consequences of their financial engineering strategies in this environment, business investment is going to be relegated to an afterthought. And this will be a further whack-down for the already limping economy. This entry was posted in Economic fundamentals, Guest Post, Investment outlook on January 29, 2016 by Yves Smith. Every firm both supplies markets, by providing goods and services, and creates markets, by paying wages and buying other people’s products as inputs. The ratio of one to the other is today completely out of whack. Everyone wants to create supply, but no one wants to create demand. hence, businesses are chasing their tails, using cheap money to buy back their own stock or some else’s through M&A. A whole generation of corporate types has convinced themselves that creating demand is someone else’s problem (although, heaven forefend, not the government’s responsibility–that’s Socialism!). So we are stuck in a combination Chinese realization crisis [to use the (correct) Marxian terminology of my youth] and, in the West, a retreat into financialization. Both have us on trajectory for collapse. If the worst effects manifest themselves simultaneously or close together, then all the ZIRP and QE in the world isn’t going to put Humpty Dumpty back together again. Back in the 80’s when the Japanese car explosion took off, the J companies were able to add capacity at will that could produce better and cheaper cars than the US cos could, and they did. Eventually, the hit (demand) capacity limits but it took a long time. In the meantime, cap ex in US mfg died. It seems that the Chinese have done something similar, except with no concern about demand limits. The investments in steel-making capacity over the last decade or so that were reported here a few days ago- and presumably everything up and downstream to make use of that capacity – are astounding. Given the lack of impediments to US-based cos investing in low-cost countries, I’m not surprised we are seeing no new investment in this country. RIP US manufacturing. Minor quibble. Back in the ’80s the American car companies could have produced better cars, but for various reasons, especially hubris and racism, chose not to. They just refused to believe those “lousy Japs” could produce a better car than they were. See David Halberstam’s “The Reckoning,” from 1986. Given the cheap trash that’s for sale everywhere, I’d say that any Dystopian Future Novel one could write is actually happening now. Consumer protection in the financial area was supposed to happen with the establishment of Elizabeth Warren’s child ‘ Consumer Financial Protection Bureau.’ I’m not certain how this has actually worked out. Seems like major corporate interests are still giving the raspberries to the consumer on things like credit cards, bank fees, ATM fees, overdraft fees, late fees for mortgages, fees for writing a string of bad checks ( happens to the best of us ) and of course the dread credit rating and credit bureaus who enslave millions because of entering into the god forsaken land of Bad. Credit. Oh. NO. Not. That. But to get back to the main thread of corporate investment (it’s all related to corporate malfeasance), consumer products get a little more shoddy each year. It seems that only in the area of consumer electronics do we get much in the way of quality and even there the willingness of major manufacturers (Samsung) to do and commit to serious product research and development and make actual serious investment seems questionable. Samsung will not step one millimeter out of their way to commit to an operating system for their phones and leaves it up to Google to do all the footwork. Does Samsung not have the soldiers needed to built a computer based operating system? ! Gag me. Tie me up and gag me. Tie me up, gag me, roll me to the end of the street and shoot me. But I digress again from the main thread of corporate self petting, or self mutilation, or self cannibalism: research and development is for other people. Clever reverse engineering can make one product work much like the other and if one is willing to not be the leader of the pack then, Why Not Let Them Build a Better Operating System (Cleaner running engine, faster operating system)? Do Consumers in these United States really know what they want?Sometimes-at least when it comes to home theater (Yes! ! !) But other times? It’s the proverbial race to the bottom. So why not self cocoon? Why not buy back as much stock as it takes to cushion the bottom line =CushBotLi or would that be CushBottomLi? A quibble: if you were to look at whatever it is the Blankfein-Dimon cohorts spends our hard-earned cash on, you might find a demand increase. Perhaps that’s why Ford should be considered a genius. People with one great idea are normal, like one-hit-wonders in music, but when someone has more than one it’s worth seeing if they have more than two. Ford implementing the assembly line is considered his great innovation. Understanding he needed to pay his workers enough to buy the product indicates his vision was at least binocular. Understood, but what I was driving at is that the ratio of making stuff to creating demand is, as I put it, out of whack. Fordism, as we used to call it in International political Economy class, was so patently and obviously a win-win for business and labor that the rollback of it since the 1970s can only be seen as a grab for power, because it wasn’t like we didn’t have rich people back then. They wanted to undercut the workers to gain more power over them, and concentrate a higher percentage of income and wealth in the hands of the 1% to gain greater control over politics and society. On one level I think this was a defensive lurch as the purported radicalism of the 1960s and the McGovern insurgency in the Democratic Party really did scare elites. But over time I think they just got progressively more arrogant and greedy and wanted it all for themselves because they thought they were smarter and more noble than everyone else because they were richer and therefore better. Japanese is the only language in the world that has a word for “working yourself to death’ – nuff said about those mythical well paid Japanese auto workers. Lack of quality in North American cars was a management decision by North American manufacturer owners and was an attempt to increase the economic juice pouring into the pockets of a few wealthy families – at the expense of North American consumers and product purchasers. The economic elites concocted the story about supposedly overpaid North American workers while they stuffed ever more loot into their pockets and moved production to Mexico and anyplace with crooked politicians willing to sell out their workers and their own people. Even the Communist Chinese were absolved of their dictatorship and forced labour as more and more manufacturing was moved into China from North America as the economic elites were determined to kill any social vehicle (like the UAW & other unions) or spokesperson for workers. Billions was poured into politicians who were anti labour and intellectually compromised economics profs so they would appease every whim of Wall Street and provide bogus academic support for bankrupt & bogus economic theories that are now bankrupting governments and middle class workers alike – all of which gives elitist bankers control of society and democratic government alike. Apparently you won’t buy lemon cars but are will to ‘buy’ lemon economic theories designed to grossly enrich the already filthy rich 1%. Look in the mirror, the person you see there is your own worst enemy – a mind re-manufactured by Wall Street and Wall Street owned and controlled media to cut it’s own throat.. The 22r was a gmc 270 with 2 fewer cylinders made from aluminum and just like gm they had to redesign it so it wouldn’t last forever. Ford understood the Great Lakes were a great site for a manufacturing operation. It’s cheaper to use currents to move parts than trucks. Ford also knew he had to pay enough to keep people from moving West. The unions did the rest. That vision of Henry Ford stuff on wages is crap. Ford shot his workers. Ford also was the first to move production out of southeastern Michigan to try to evade or at least weaken the union, well before GM’s southern strategy, though as you point out mostly around the Great Lakes (though the plant in Edison NJ was a bit of an outlier). Yes indeed. Look up Harry Bennett, Ford Service Department, Battle of the Overpass. Ford hated unions almost as much as he hated Jews. The pollution in the mud at the outlet of the Rouge River just downstream from the huge Ford Plant was dredged out one year and hauled to Grassy Island which became part of the Detroit River International Wildlife Refuge. Typical of the solution here-allow so much pollution to take place, then create a Wildlife Refuge. The same thing was done in the Toledo Ohio area at the Cedar Point National Wildlife Refuge. And in this mornings’s financial engineering news, Xerox will be splitting in two, just 5 years after it bought a business services company that was supposed to be its salvation. The Rochester business press is trying to figure out how many jobs will be destroyed by the $2.4 billion in `efficiencies’. CEO Ursula Burn’s word salad description of the deal on CNBC [warning: autoplay] has to be heard to be believed. President’s Council on Jobs and Competitiveness. made possible by QE ∞.